No more babies for me either; however, I have not taken that final plunge to remove my ovaries and tubes. Being BRCA2 positive, this decision makes many people nervous, including my mother, sister, BRCA Sisters, friends, and every doctor I have visited since my gene mutation diagnosis. The only person who is not really worried is me, which is all that really counts. It’s an essential concept that I now teach in Bloom with Bliss: making decisions using intuition. Surprisingly to me, a prophylactic bilateral mastectomy surgery felt right in my case. It didn’t feel good or easy, but the idea of having it done resonated with me. On the other hand, when I had planned a 2-for-one follow up reconstruction surgery combined with an oophorectomy (removal of fallopian tubes and ovaries), I was a huge mess over it. Once I canceled the oophorectomy part of the operation, I was completely calm. That part didn’t work for me, and I don’t know why. However, it’s the decision that I made and I’m sticking with it. I am fully aware that there is no accurate monitoring system for ovaries and that once it’s detected, the cancer may have grown too much. I know this from Lauren, as well as the many BRCA Sisters who generously share their stories of struggle on Facebook groups. My heart goes out to them, but my ovaries still need to stay in. Yes, you can live without your ovaries, and you can live without other body parts, like a colon too. Ask my mother, who has had hers almost completely removed because of colon cancer 2x. If I really wanted to be preventative, that organ would make sense with my family history. However, there are repercussions with preventative operations. It’s like going to the casino and gambling your hard earned money. You may walk out with a win or you may lose, and suffer some consequences as a result. Surgical side effects are unpredictable like that. 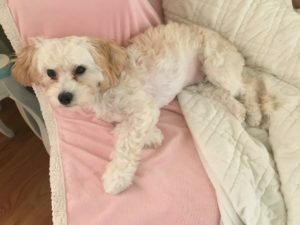 On the way to Sugar’s hysterectomy surgery, I looked at her sitting beside me, and became completely overwhelmed with empathy and guilt for taking away her right to have babies. I suddenly felt the sorrow that women feel who make that choice—or are forced to— because of their BRCA mutation or Ovarian Cancer. Even when we don’t plan on having more babies, it can feel like a loss knowing that we can’t, though we have time left on our clock. In essence, some decisions are our own, while others can feel forced upon. When we have the power to choose, it’s important to appreciate that right, and make a decision that feels complete, in spite of what other people say or think. For me, I will continue getting an annual ultrasound, CA125 blood test, and tune into my body, so that I may notice any changes. Yet most importantly, I will stay tuned into my intuition until it feels right to make a different decision. If all else fails, I can always turn to the Magic 8 ball for an answer.